Known also as the Big Red Robe, Da Hong Pao is one of the Top Ten Famous Chinese teas. Da Hong Pao Oolong Tea is produced in the Wuyishan Mountain area of North Fujian, and from the tea cultivar Da Hong Pao. The name comes from a story that the three mother trees of Da Hong Pao were once covered by the red robe taken from a grateful imperial official, who was once saved when he was as a young student, by the monks who managed the three tea trees. Thus the tea trees got their name Da Hong Pao-Big Red Robe. The Da Hong Pao is a very famous and precious Chinese tea. There was one interesting story that in 1970s the American President Richard Nixon started his ice breaking visit to Communist China. The Chinese warmly welcomed him. And one of the gifts President Nixon recieved was 200g of Da Hong Pao. He was confused and felt jealous. He asked the then Chinese Premier Zhou En-lai why his Secretary of State Kissinger (He had a trial visit to China prior to the presidential visit) got a few kiloes of Huang Shan Mao Feng gift and he got so much less tea gift. The Premier Zhou smiled and answered to him. President, the all China’s annual production of Da Hong Pao is 400g. You already took half of the China’s output of this tea. The Da Hong Pao gift to President Nixon was made by the tea leaves plucked from the mother trees which grow in the middle of the rocks, which was considered even more valued than equivalent quantity gold. Wuyishan as a rocky mountain is an ideal place to produce good quality tea. As the classic tea book “Cha Jing by Luyu” expressed that Good quality tea grows in the rocks, Middle quality grows in the little stone and sandy soil, Low quality grows in the yellow earth. 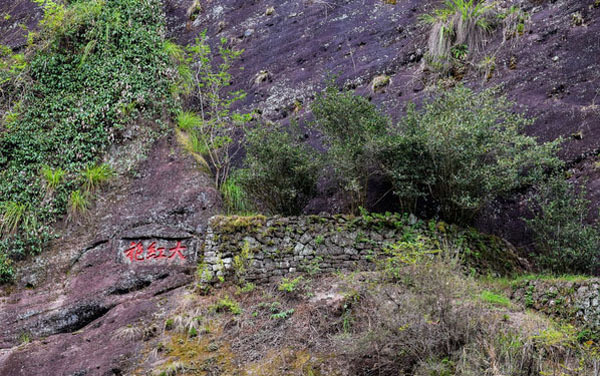 The rocky growing surroundings endow the Da Hong Pao oolong tea with rich minerals content, which makes the tea appear the special taste of Yanyun, a taste of rich minerals. And also in the rocky mountain area, it lacks fertile soil, which makes the tea leaves to grow slowly, thereby helping leaves to accumulate more quality contents. Da Hong Pao Oolong Tea is made by the grown tea leaves plucked in and around the beginning of May. The manufacturing follows the typical Chinese oolong tea processing. It differs from one other famous Chinese oolong tea Tie Guan Yin in that it does not undergo bag rolling, and the roasting of Da Hong Pao is heavier than Tie Guan Yin. So the tea body of Da Hong Pao is open loose leaf and the color is oily dark due to the heavy roasting. It is closer to the Guangdong oolong tea Phoenix Dan Cong, than Tie Guan Yin. The roasting of Da Hong Pao is conducted by charcoal heat. How Does It Taste? Da Hong Pao gives the rocky floral flavor and meanwhile a flavor of roasted peanut shells. The taste is clear smooth mellow, and can feel a special kind of feeling yanyun 岩韵 in the mouth, just like the fresh mountain spring water from the rocks with rich minerals. Step 3: Infuse – To make the best cup of Da Hong Pao Tea, it is advisable to keep the steeping time of 1-2 minutes. By Gaiwan Gongfu style, it is advisable to keep the steeping time 15seconds. To know more information of the Da Hong Pao as a Wuyi Rock Tea, please visit our blog wufeng-tea.com/wuyi-rock-tea/. Da Hong Pao Tea and a range of other premium loose Chinese teas are available for bulk purchase at Wufeng Tea.